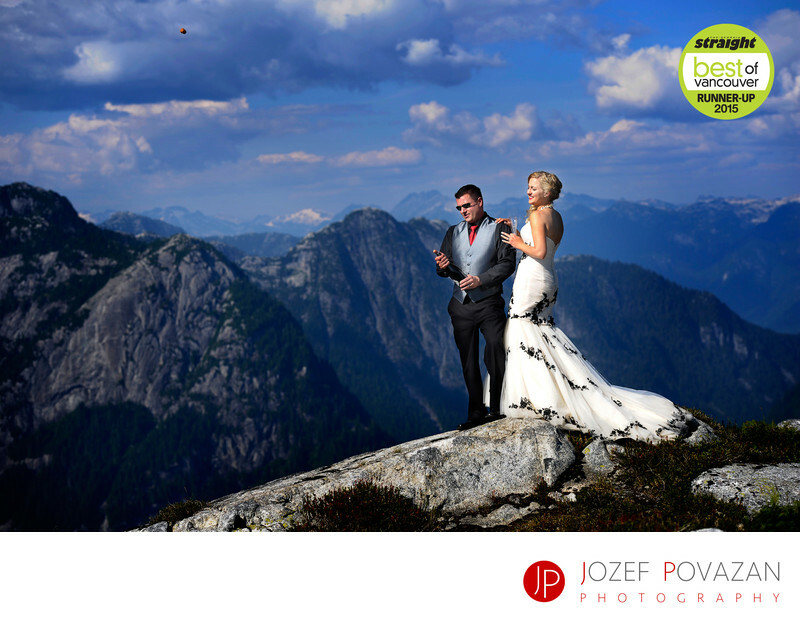 Helicopter Mountain wedding best Vancouver photographer - Best Vancouver wedding photographer Jozef Povazan Photography studio. Helicopter Mountain wedding photographed by one of the best scenic oriented Vancouver photographers Jozef Povazan from Povazan Photography. Couple opening a bottle of Champagne sparkling wine on the top of a mountain above Widgeon lake, west of Golden Ears in Maple Ridge. You can even see the cork captured flying in the air. If you like to have wedding day portraits created above the sky, contact Sky Helicopters for a quote. I love to fly with them, clients love how easy going these pilots are. Best views in Beautiful British Columbia around you. Your wedding dress will for sure stand out against dark blue sky up there. Epic, scenic, unique wedding pictures from one of the top destination photographers in Vancouver. Award winning imagery for your family. Location: Widgeon Lake Maple Ridge. Keywords: Helicopter Mountain wedding best Vancouver photographer (3).